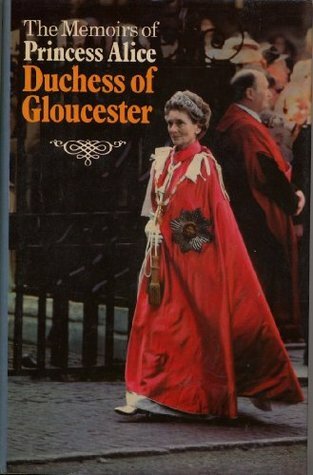 I enjoyed reading the memoirs of Queen Elizabeth II's late aunt, Princess Alice, Duchess of Gloucester. She was witty, well traveled and a keen observer of changing social customs and the nature of royal life. Her descriptions of her aristocratic Scottish childhood read like Downton Abbey - there was one maid who made the boiled eggs for breakfast in the stillroom while another maid made the scrambled, fried and poached eggs in the kitchen. As an adult, Alice traveled the world. In her 20s and early 30s, she spent time in Kenya (where she learned Swahili), South Africa, India and Pakistan (where she joined an expedition to the Afghan border). After her marriage to Prince Henry, Duke of Gloucester at the age of 34, she had a busy schedule of royal engagements during the Second World War and overseas tours including 2 years as viceregal consort of Australia. Henry and Alice brought their two young sons to Australia and there are fun anecdotes about the royal children on tour. Highly recommended.